This London Fashion Week I had the great opportunity to work with Fred Butler and create installation props for her SS12 presentation at Somerset House in the Portico Rooms. 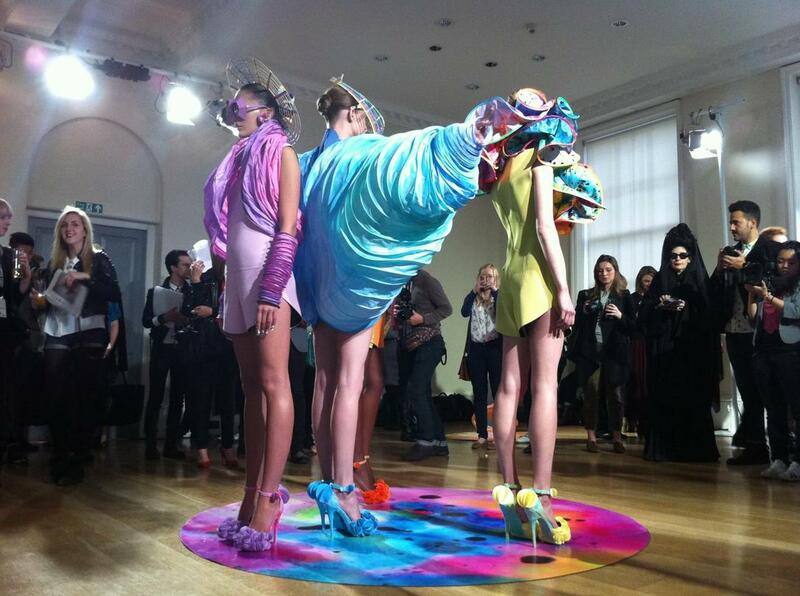 This season Fred's collection was all based on Sea slugs and showed her accessories off on a much larger scale, this time encompassing full body suits, slinky style jackets, sunglasses, headbands and some rather amazing shoes. The collection as always was a cosmic mix of colour and textures, with hand painted fabrics by Fred herself and the presentation was styled by Kim Howells. For the event staged in the Portico rooms 5 flat base mats were created as circles each of which had a photographic print of Fred's painted texture design on. In each corner of the room lay 1 each of the 4 smaller circles, individually colour coded in blue, orange, lime and lilac along with a speaker enclosed in a hood of the same colour designed by Fred. In the center of the room lay a larger circle in a multicolour effect. As the models entered the room they took a base station at their colour corresponding circle. There was a sound track created by Patric Wolf which was broken up into 4 sound channels, as the channels increased in sound the models would take their place moving into the center and when all channels were playing they would finally all meet in the middle. The event turned out to be very busy yet the atmosphere in the room was extremely serene. People exchanged comments on the extraordinary garments and were all taken away to another cosmic world for a short space in time.